Well 5 Million in the UK trapped in dead end jobs - they are saying less than 15K a year - but i'd go further and say there are many people on more than this - you know with large mortgage, kids, aging parents earning a good bit more who are essentially trapped, and there is more expected off them. I always find it strange how people never connect their working lives with how little choice they really have. A lot of people are scared to lose what they have in order to gain something more. One of my riders is a guy from Leeds, he has been systematically exploited by his company for the last 5 years, I keep telling him to go and do something else, but he is scared of unemployment and risk. Does loyalty exist anywhere in the workplace - maybe smaller places. There is sheer ruthlessness of many employers and organisation amazes me - they will get rid of people they don't like, throw people into impossible jobs without support or help - there is no culture of being in a team or a collective, or people working together - corporate culture tries to promote teamwork - but the most workplaces i have worked in it is essentially every man or women for him or herself. Plus there is no commitment to train or develop people or give them a long term goal - most of the managers i worked with don't give a hoot about anyone they manage - the only aim is to climb up to the next level of management. Although the problem with job hopping - your always going into a new situation at a disadvantage to the longer term staff - therefore they will purposely keep information to themselves, make life harder - and if your just job hopping to the same type of job. Peole trapped in dead end jobs. People trapped on benefits. I don't understand the sense of the metaphor: trapped means no choice, but these people have positive income and do have choices. I do understand that someone with a mortgage he can't afford is genuinely trapped - except he can opt for bankruptcy. It's still a free society. They are the ones holding the keys to their cages though, it is fear of the unknown which is keeping them in their trapped status. The reality is that the structure of organisations is increasingly centralised and a few whizzkids at the top find ways dumbing down the workforce. I remember hearing a famous chef on the radio bemoaning the fact that a restaurant chain had approached him to create a menu that anyone could make so they wouldn't need trained chefs anymore and could 'deskill' their kitchens. This process is happening in all businesses right now. Walk through a typical town centre and look at the tops people are doing - street cleaners, shop workers, McOffice drones massively outnumber those on even the mean average salary. Wage slaves have few choices. They often work long, stressful hours with little time to plot their escape, no resources to increase their skills. Not everyone can sit on HPC all day and come home fresh as a daisy. 5 / 10 years ago it was much easier to find work..but as things in the near future will get much much worse, I'm not surprised ppl wouldn't want to throw caution to the wind. 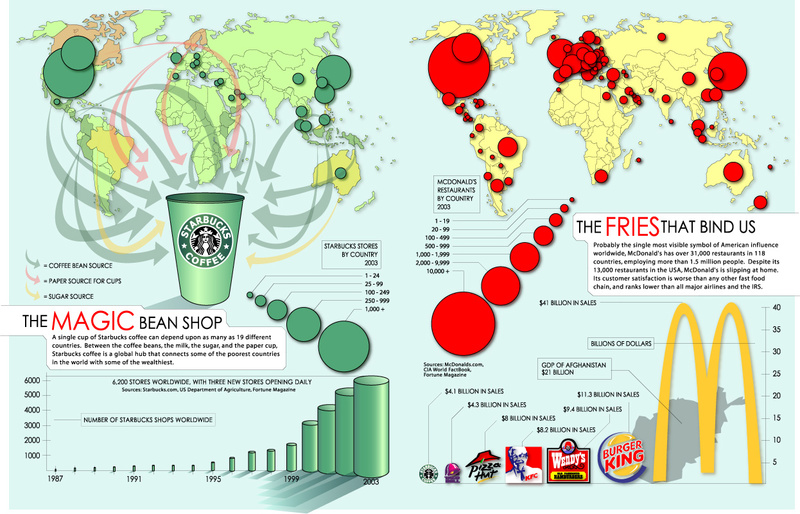 McDonalds is the worlds most successful restaurant (by number of outlets). Not because it's the most tasty or nutritous food that they serve. But it can be run by anyone. The aim for global corporations is for every city on the planet to look and feel the same. In the IT virtual world, every computer operating system (nearly) is Windows. Survive, thrive, divide and conquer, devastate, and dominate. But Ken, you are known for doing low paid jobs. At least thats the impression you give on here. What's the shame in ppl doing low paid, "dead end work"? Perhaps they reject the whole corporate bum lickery thing. I've heard of Oxbridge graduates purposely working in supermarkets, where they reject the whole "career ladder" ethos...I don't blame 'um...its a load of cobblers..
Also, when was there ever a time in history when most people weren't in dead end jobs? Working the fields or in domestic service, later in industry and finally in the service industry and public sector, most people have always just chugged along. Most people are content with a regular paycheque and don't buy into the idea that if only they found the right job they would be 'fulfilled' in some way. Let's face it also in the west most people have it far better than they ever did in history, apart from a small blip with the boomer generation in the 60s/70s. At least we have the freedom to chuck it all in if we want to. There's a good scene in 'Up in the Air' when several of the people laid off said they found it bearable because their family was what really mattered to them, not their job. This doesn't mean I'm trapped though does it? I save a fair wad of my cash (which is why I'm fearful of the printers) and have always kept a reserve behind to jump when needed. I also do work on the side which I keep quiet about completely. Because I have no mortgage or obligations I can simply walk away. Fear however NEVER gets in my way, technicallities timing and also opportunities get in my way though. Which is why I ask a lot on here as to making choices because I know I am not objective. For example the chippy, I turned down some fairly decent jobs in Asia for this chippy, then the SoB snatched it away from me....which made me incredibly angry. Its not that, in that the options are not merely greasy pole 1 or greasier pole 2. There are a multitude of other potential options to choose from. You could work for youself for instance. Dead end jobs and poverty- there related to higher rates of smoking, drinking and obesity - where is the incentive to improve yourself if your getting dragged down by your fellow wage slaves, where is the incentive to save anything if getting property ladder is impossible. All day in Mcdonalds working - all you want to do is come home and watch TV. yeah you could argue that in the west - were relatively well off, no one will go hungry but wages slaves are on a financial treadmill until death - chuck it all in and do what?? be on the the dole for the rest of your life living on the bare minimum?? She added: "However, there might certainly be a grain of truth in what they've found - there are higher expectations on people of this age in terms of what they've achieved in their careers and family life." Ppl are expected to go through the career treadmill. Fine..if that's what you really want to do, then go ahead, but its not for everyone. Do what makes you happy... The cost of living (high house prices) push ppl down the route of taking well paid jobs that they might actually dispise... You can live on a lot less if you want to, and cut out the crap.. Agreed the problem is society has a hell of a lot of irrational norms. For instance everybody constantly asks me why aren't you married yet why don't you have children yet. The better answers are to have a partner is so you have somebody to talk to who ought to understand you. The worse answers are the kind my dad gives me, to get married because everybody else is getting married. And doing things because you are expected to do them. Asians hate me because I am not restricted by their societal norms and I'll tell them it to their face! One thing I do agree with David Icke, is that ultimately people are scared about what other ppl think....People do what is expected of them, in order to "fit in", and not rock the boat. I know, for instance, that during my parents generation (30 or 40 years ago), you were expected to get married and have kids by the time you were 25. If you hadn't, then there must be something wrong with you...you must be gay or something.. I'm sure that a few of my chums are jealous of my singledom...I know a few who have been with their partners for a few years, and are bored out of their brain...I think that they're jealous of me, where I can do and go wherever I want, and meet whoever I want. That is true, and to a certain extent, you control your own destiny, but the trouble with self employment, is that work is not always regular. I completely understand why ppl want to work as an employee - regular pay and regular hours (usually). In a democracy you say what you want, but you do what your told. Many people are not bothered about making oodles of money, they don't want to take risks, they just want enough to get by. And also, many people are not very clever. I'm not in a supermarket, or from Oxbridge, but am reasonably happy where I am, enough to not go out looking for other jobs elsewhere although if I spotted a preferable practical way of living I would leave. However, one of the things that does annoy me about it is there does appear to be an inbuilt view that there should be some sort of career ladder. There are the irritating corporate parts that get in the way of doing the job, such as the annual "Where do you what your career to go?" nonsense. "Nowhere" gets you dirty looks, although they never explain what's wrong with being happy where you are despite pointing out all the things you need to do to advance, which are almost universally things I don't want to do. I am quite naturally ambitious, I don't expect career success to hand me total fulfilment and happyness but "doing well", progessing at work and earning good money bring me pleasure. My ideal scenario is to earn enough money fast enough, young enough to then stop working or move to a low paid job to keep ticking over. I don't want to pay the governement a single penny more than I have to. If I'm lucky in 10years I'll be stacking shelves or working behind a bar and I will consider that the pinacle of my career. There that infamous question you're asked at interviews - "Where do you want to be in 5 years"..If you say "Nowhere" - is that a good or a bad thing? Does that make you less of a threat to your potential new boss, or does that make you "unambitious"? Good plan. I hope to have a wee business going that will provide me with flexible work that I can pick and choose at. Who knows what I will think next year though. One of the best things of not doing 'commitments'. Depends on the job I suppose. Unless it is a very senior role and you said it in the right way - I think it would be a positive. Everyone knows these days that people chop and change jobs all the time. I reckon most bosses assume people may be gone in 2 years. Any more is probably seen as a bonus. People like honestly. "I don't plan to be anywhere in 5 years, but I will happily work my **** off for you - to earn money for the next 2"
I reckon that would be a goer for most places. Depends on the role of course. People often forget the person interviewing them is likely to be thinking similar things. At least half could do something about this if only they could be arsed. Do tell oh great sage, where can these 2,500,000 well paid stimulating opportunities be found? Set yourself up as a life coach for the newly unemployed. There'll be a load of former public sector employees out there with redundancy cheques burning a hole in their pockets. Become bicycle repair man. A lot of Britain's newly unemployed/economically inactive middle class seem to have become born again Lance Armstrongs - it's an ill-wind yadda, yadda, yadda.